Over the past few days, various groups of people, including students and defrauded creditors, continued their protests in different cities of Iran. A group of people in Hirmand, in Zabul, gathered in the area on Friday, March 1, 2019, in protest over the unresolved conflict of urban sewage. Students from the University of Tehran held a protest rally on Thursday, February 28, 2019, at the University’s Disciplinary Committee. On Tuesday, February 26, 2019, students from the Sharif University of Technology protested in the male and female student dormitories. According to the protesters, the reason for their gathering was the lack of attention of the authorities to the letter of over 2,400 students to the university president about the lack of security around the campus, dormitories and the lack of transportation service. Married students at the University of Tehran also held a protest rally on Monday, February 25, 2019, in protest to the violation of laws by the Department of Dormitory and Cultural Affairs. A group of defrauded creditors of the Badr Tous Institution in Mashhad held a protest rally on Wednesday, February 27, 2019, demanding severe punishment for government officials who have plundered their assets. On the same day in Rasht, defrauded creditors from the Caspian Credit Institute gathered inside the building of the institute’s branch and chanted slogans while banging on the table. Women led this protest movement. Also, defrauded creditors from the Caspian Credit Institute (formerly known as Paivand Co-op) in Nishapur gathered at the city’s governorate on Wednesday, February 27, 2019, in protest to the looting of their property. 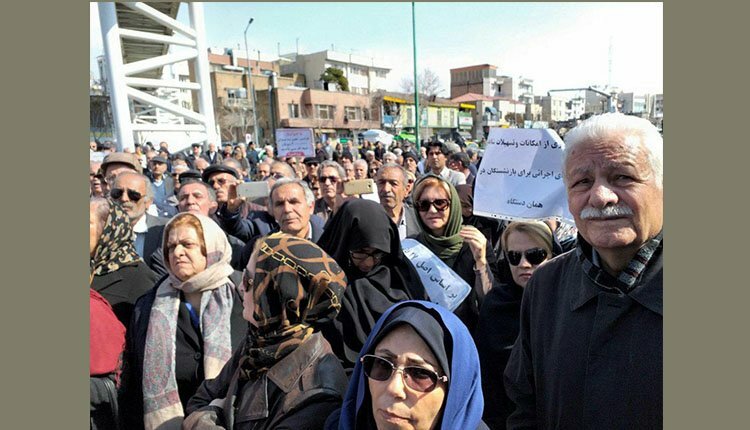 On Tuesday, February 26, 2019, the defrauded clients of the Maftah Rahnavard Company launched a protest rally in front of the parliament in Tehran, in protest to the lack of delivery of their pre-purchased vehicles. At another gathering on Tuesday, February 26, 2019, a group of retired government employees gathered in front of the parliament in protest to their poor livelihood situation. On the same day, a group of lawyers and civil and political activists gathered in the home of Nasrin Sotoudeh, imprisoned lawyer in Evin Prison, and met with her family.